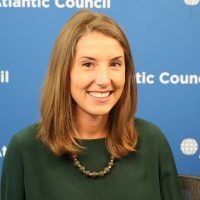 Ellen Scholl is deputy director at the Atlantic Council’s Global Energy Center. Ms. Scholl has worked on a range of energy issues throughout her career, most recently as Robert Bosch fellow at the German Institute for International and Security Affairs (SWP) and the Federation of German Industries (BDI). She also has over five years of energy-related legislative experience, having handled an energy portfolio as committee staff for the U.S. Congress and Texas Senate. Her work on energy and geopolitics and energy governance has been published by SWP, and her work has appeared in the Berlin Policy Journal, the European Energy Journal, Foreign Policy, and Lawfare, among others. Ms. Scholl also worked on energy issues as a graduate fellow with the Robert S. Strauss Center on International Security and Law, and as a member of the inaugural cohort of the U.S. Foreign Service Internship Program, during which she worked in the Bureau of European and Eurasian Affairs and at U.S. Embassy Ankara. She received her master’s degree in global policy studies, with a certificate in Russian, East European, and Eurasian Studies, from the LBJ School of Public Affairs, where she was a Powers fellow. She earned a BA in humanities and government from the University of Texas at Austin in 2008, where she graduated with highest honors.